Plot Summary: Joel Fleischman, a doctor from New York, arrives in Alaska to fulfill his medical school financial obligation by working as a doctor in Anchorage, Alaska, for four years. However, upon arrival, he is quickly sent to the small town of Cicely, on the ‘Alaskan Riviera’. Listen to our podcast of the episode here. When the premiere episode of the summer replacement series Northern Exposure aired on July 20, 1990, the reactions from two national newspapers were mixed. John J. O’Connor of The New York Times wrote, “it is not throwaway summer fare” with characters that “kind of grow on you”, though he added that it could get “overly cute” at times. In an article titled “Smug Doctor Can’t Cure Ailing Premiere,” Chicago Sun-Times critic Lynn Voedisch panned the first episode, calling the main character “impossible to like” and the town “full of yahoos.” Northern Exposure was strategically tested in the rerun-soaked summer season, when unique, off-beat shows had a better chance of receiving audience interest. In 1990 the most popular shows were sitcoms, with Cheers and Roseanne leading in the ratings. But no one expected the show to be a hit and it was a surprise to most that it ran for five seasons, earning numerous awards including 7 Emmy Awards (in 38 nominations). There have been several discussions recently about the greatest TV series of all time. These have been spurred on by the conclusion of AMC’s Breaking Bad. Most of the shows mentioned in these conversations are wonderful. Would a list of these shows be complete without including (to name just a few) The Wire, The Sopranos, Mad Men, Breaking Bad, The Twilight Zone, Twin Peaks, and Buffy the Vampire Slayer? No. These are all great shows. 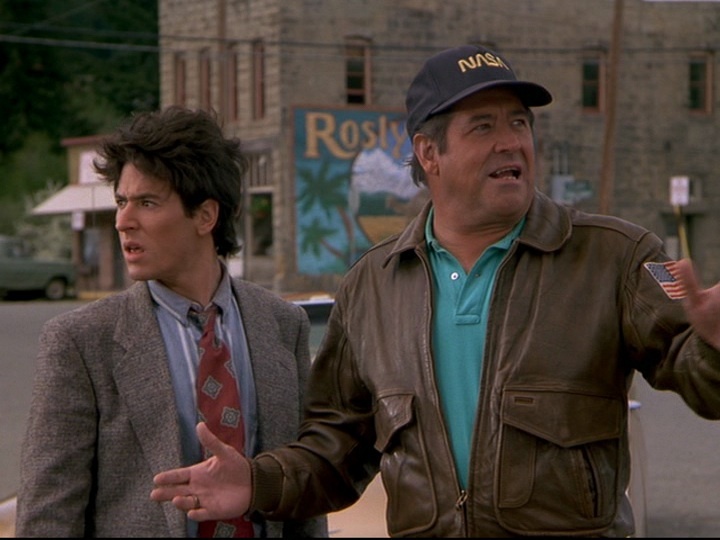 And so is Northern Exposure. It doesn’t have the sociological scope of The Wire or the surreal darkness of Twin Peaks, but it does have an astonishingly rich cast of characters that breathe life into the show’s sharp dialogue. 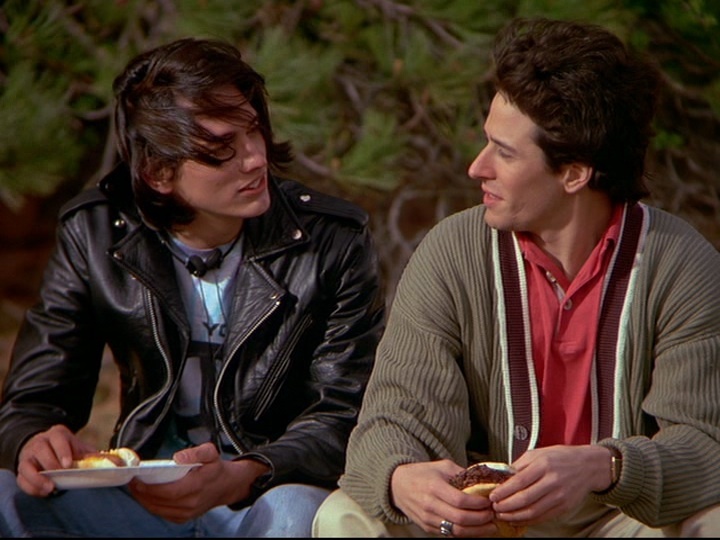 Dazed and Confused and Jackie Brown have been called “great hangout films” because you get to spend unhurried time with the characters, Northern Exposure is a great hangout show, albeit one filled with literary, philosophical, and historical allusions. Come for the characters, stay for the Kierkegaard. He is told he is no longer needed to serve in Anchorage, but in the midst of his jubilation at finding himself ‘free,’ he is told the news that he is being sent off to Cicely, Alaska (turning the good news upside-down). He is also told that Cicely is a city comparable to Aspen that is a mere “bus ride from Anchorage.” A montage of his bus trip shows Joel’s mood going from jubilant to bored to frustrated. When Joel, one of the last remaining passengers, finally exits the bus, it becomes clear that Cicely is a great distance from the nearest city. Cicely is not “the Alaskan Riviera” he had been promised; it is a tiny town consisting of fewer residents than you would find in a typical apartment building in New York City. Initially, he was told that if he didn’t like it in Cicely, he could leave, but he learns this is not the case. He considers himself a captive and is (indirectly) threatened by Maurice with a shotgun. He is left stranded in a truck when his driver, Ed, suddenly abandons him to walk home. If Joel does leave, the state of Alaska will fine him $10,000 and put him in jail for 18 years. However, the episode is cleverer than that, not willing to just let the audience side with Joel. Our main protagonist challenges the audience with his difficult personality; he clearly has a temper and calls Cicely “a hole in the wall pigsty” in front of the patrons of the town tavern while on the phone with his girlfriend, Elaine. He incomprehensibly mistakes Maggie for a prostitute when she arrives to take him where he will be residing; he initially refuses to treat an office-full of patients waiting for him the next morning; he dismisses Marilyn, telling her repeatedly, “There is no job.” Joel is portrayed as helpless as possible, without any survival skills whatsoever (for example, he tries to protect himself with a golf club against rats – which are abnormally large, but still). We experience the character of Joel through a series of reactions – disbelief, outrage, anger – but the audience’s own reaction to him depends on their own outlook, personal experience, and, quite honestly, tolerance. Are Joel’s reactions reasonable? Of course, he has been dealt an injustice, having been lured to Cicely under false circumstances. But to side with Maurice, Joel did put his signature on an agreement, perhaps not considering the reality of what he was agreeing upon. It is at this point that viewers find themselves at a crossroads. Do we take on the view of Joel or Maurice? Or do we ourselves see the fictional town’s beauty as a kind of longing for a simpler life? At this point, the town is on the cusp of being, in the mind of the viewers. It is after all, the pilot, the beginning of beginnings. Ed – We are first introduced to him driving up in an old truck to pick up Joel. 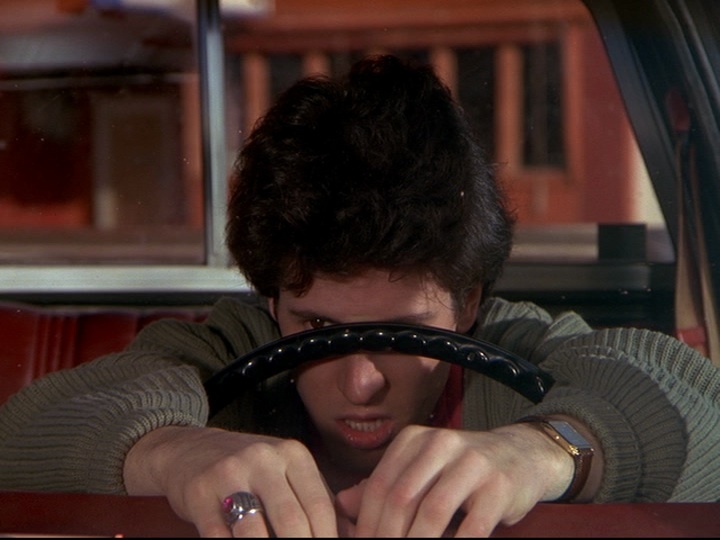 But in the middle of driving he slides out of the car with the engine running, leaving Joel alone in the middle of the road. Strange and not particularly consistent with Ed as we later know him. Maurice – In his first appearance he is in a harness on top of his house and quickly rappels down. Why on earth he needed to be there is unexplained, nor do we see him doing anything quite as active in the rest of the series. Ruth Anne – She is introduced as running the general store but has no idea what a bagel is. Really? There is a lack of subtlety to many of these freshly-introduced characters because we rarely see beyond the eccentric façade, making them often appear exaggerated. However, even in the confines of a pilot designed to instantly appeal to audiences, some characters already appear surprisingly nuanced. We’re writing, of course, about Maurice and Holling. Maurice is perhaps the most well-developed character in the pilot, despite his over-the-top entrance. An ex-astronaut, he is emboldened by success and is confident in his belief that Cicely will one day become the jewel of Alaska. He is positively American, an example of the country’s exceptionalism and capitalism. By contrast, Holling’s first appearance has much less fanfare; he simply points Joel to the pay phone at The Brick. Soon after, he reveals his kindness by bringing an agitated Joel a free drink and a meal while he is waiting for Elaine’s phone call. We learn just the bare outlines of the animosity between Maurice and Holling, of the rift between them over Shelly, of their mutual desire to reconnect. It is one of the final scenes that anchors the whole episode, with the two old friends speaking frankly for the first time in a long while. Maurice reveals a depth of feeling we didn’t know he had. Instead of addressing the situation with Shelly, he talks of his experience as an astronaut: “Gravity. It keeps you rooted to the ground. In space there is no gravity, you just kinda leave your feet and go floating around. Is that what it’s like Holling? Being in love?” He is at once sad, wistful and resigned. Between the two of them there is nothing much to say, but their strong bond has been re-established. 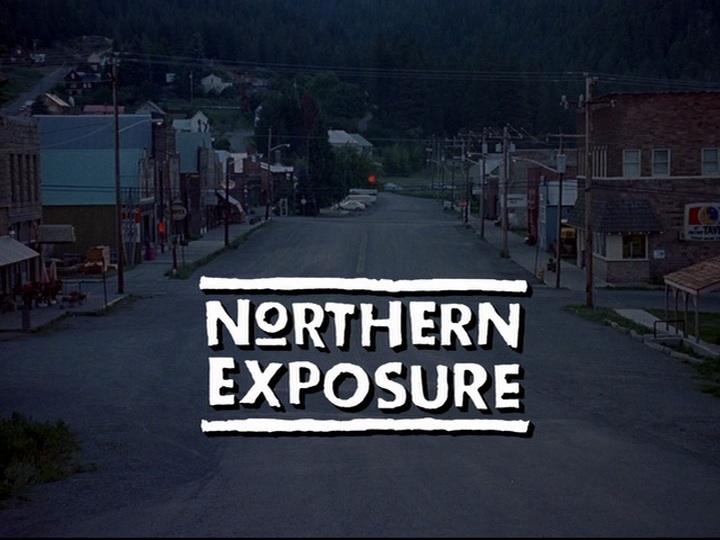 It is at this moment that we see the seedling of Northern Exposure and what will become – a show about people who think and feel deeply, and who struggle with each other, and struggle with themselves. The relationship of Holling and Maurice is reflected in the minor story between Walter and Edna. Walter keeps getting harmed by his wife (first shot in the leg, then stabbed in his shoulder), and Joel remarks that she will end up killing her husband if this continues. They are given three choices: to divorce, to separate, or to talk. They choose to talk. 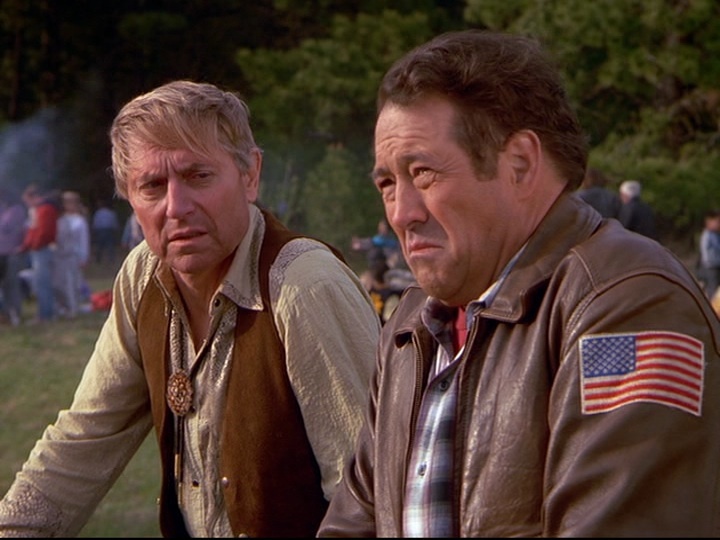 Like Walt and Edna’s relationship, Holling and Maurice are at the point in their relationship that one might end up killing each other (Maurice threatened to blow Holling’s head off, if he ever tried to talk to him, apparently). The other pairing in the episode, Joel and Maggie, are still very much in the fighting stage in their relationship. The Good – Maggie is a breath of fresh air; everything about her – her super short hair, fresh face, tomboy clothes, and assertive (yes, and defensive) air – makes her unique in television. The Bad – The theme song which recurred over and over was a little distracting and a bit too much, as if announcing ‘Hey! It’s the show!’ over and over again. The Notable – Although most of the major characters are introduced in the Pilot, we don’t meet Chris. However, in the Summer Wonderland Festival in the end we can catch a brief glimpse of him cheering among the crowd. ← The Alaskan Riviera is Alive!